Healthy outdoor living means protecting the environment. Today more designers and consumers are interested in ecologically-friendly designs and products. Sturdy, durable outdoor furniture with a long lifespan is more appealing than "disposable" furniture meant to last only a few seasons. Products That Withstand the Test of Time Just ask around, Homecrest customers are well aware of the longevity of our products. Many consumers have had Homecrest outdoor patio furniture that is over 30 years old, and they are still using it with great satisfaction. Homecrest Outdoor Living products are designed and tested for an extended life cycle to reduce our impact on the environment. We consistently conduct testing at higher levels than the industry requires, ensuring our product life span for many years. 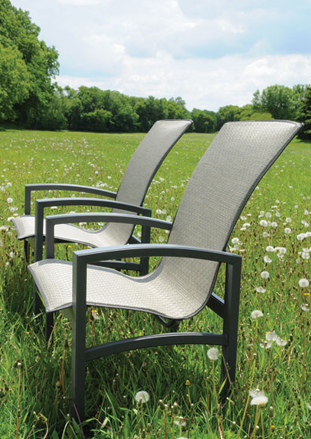 Our outdoor patio furniture frames are aluminum, steel and wrought iron, all of which are recyclable materials. In addition the cardboard cartons used to ship Homecrest furniture are recyclable and our packaging is designed to have as minimal an environmental impact as possible. Chairs, chaises and tables are packed in multiple-units to reduce packaging. Heat from our finishing ovens is captured to help warm the manufacturing facility in cold weather. A significant concern as temperatures in Minnesota can plummet to 10 - 20 degrees below zero in the winter months. All processes meet or exceed EPA standards. The plant cleaning and finishing systems are water-born, not chemical-born, protecting our employees and the environment. The amount of hazardous waste and VOC emissions is nearly non-existent. The wash stages for products are cascaded so that water is used many times before disposal. Replacement Slings and Cushions are available to extend the life of your Homecrest Outdoor Living furniture. Just visit your local dealer or click here to order new Slings, Cushions, paints, parts and more from Homecrest to make the most out of your outdoor patio furniture.